Keep your Cuisinart blades and disks safe and secure with the Cuisinart blade and disk holder. 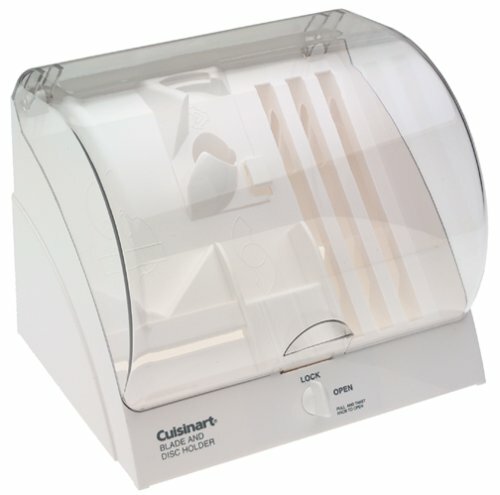 Constructed from high-impact plastic, this simple unit provides storage for three Cuisinart blades and three cutting disks. It is designed for use as a stand-alone storage or side by side with Cuisinart’s supplemental disk holder. The effective tamper-resistant locking device must be pulled out and twisted 90 degrees to access the cutting tools, and automatically relocks when the lid is closed. Also, since each blade holder is shaped to snugly fit its designated blade, the cutting edge of each disk is completely protected. Effective but odd design. Well thought out placement for parts storage but surprised that the whole bottom of the case is open where the blade discs sit in the slots. If the lid latches for safety why is it open underneath?